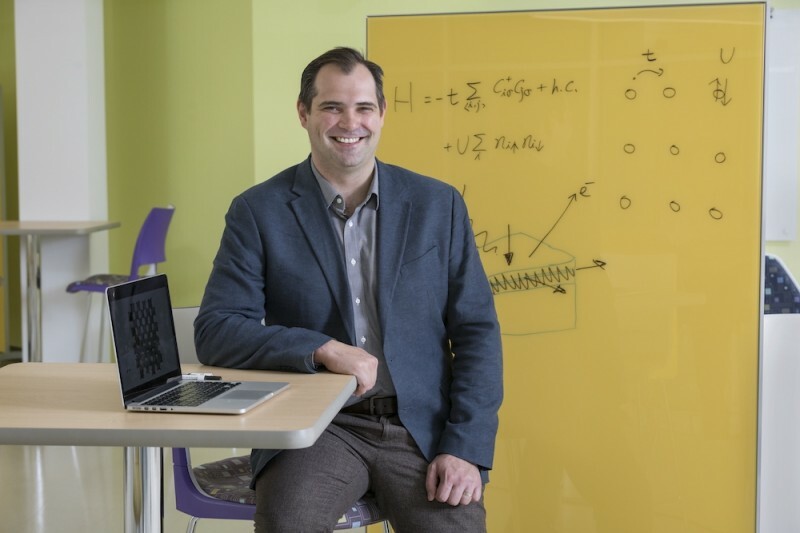 Louis Piper, associate professor of physics and director of materials science and engineering at Binghamton University, photographed at the Smart Energy Building at the Innovative Technologies Complex. BINGHAMTON, N.Y. — Computers in the future could be more energy-efficient, thanks to new research from Binghamton University, State University at New York. Devices like drones depend on a constant WiFi signal – if the WiFi stops, the drone crashes. Louis Piper, associate professor of physics and director of materials science and engineering at Binghamton University, wants to make more energy-efficient computers, so things like drones could be responsive to their environment without worrying about a WiFi signal linking it to a larger computer machine. Scientists have developed “neuristor” circuits that behave similarly to biological neurons in the human brain, which can perform complex computations using an incredibly small amount of power. More recently, a vital component of this neuristor circuit was created using niobium dioxide (NbO2), which replicates the switching behavior observed in ion channels within biological neurons. These NbO2 devices are created by applying a large voltage across a non-conductive niobium pentoxide (Nb2O5) film, causing the formation of conductive NbO2 filaments which are responsible for the important switching behavior. Unfortunately, this high-voltage and time-consuming post-fabrication process makes it near impossible to create the dense circuits needed for complex computer processors. In addition, these NbO2 devices require an additional companion capacitor to function properly within the neuristor circuit, making them more complex and unwieldy to implement. In this study, Georgia Tech researchers created Nb2O5−x-based devices that reproduce similar behavior of the combined NbO2/capacitor pair without the need for the added bolt of energy. Binghamton researchers verified the mechanism that was being proposed. This finding, said Piper, could lead to more inexpensive, energy-efficient, and high-density neuristor circuits than previously possible, accelerating the way to more energy efficient and adaptable computing. Now that they’ve verified the models, Piper and his team want to find out what’s going on in the actual device as it’s operating. “The real effort at Binghamton has been toward trying to model, from an atomic point of view, the nature of these states, how they arise from physics and chemistry, and also instead of just looking at the inert materials and then correlating it with the device performance, can we actually see how these states evolve as we operate the device?” said Piper. This researcher was supported by a grant from the Department of Defense. The paper, “Scalable Memdiodes Exhibiting Rectification and Hysteresis for Neuromorphic Computing,” was published in Scientific Reports.